If you close your eyes, there is no knowing where you are; so it has been said, at any rate. When I close my eyes, I am most often in one of two places: Melbourne, or the Greek village where I have lived on and off for the last 30 years. When I was first in Greece, and had come to accept that I would not be returning to Australia any time soon, I would close my eyes and see not rocks, tufted mountains, olive trees and cypresses, but a maze of suburban streets edged by clipped nature strips, each of which had a prunus tree planted in its centre. It was one way of coping with the pain of migration. Now that I'm in Melbourne on yet another visit, I close my eyes, and am immediately 10,000 miles away, wondering how my two Greece-resident sons are faring. My eldest, who lives in Melbourne, wonders this, too. Greek life is very hard: again. My sons are no longer little boys, but how clearly I remember the way they were. The third was born in Athens, but his brothers had been born in Melbourne, and migration was the last thing they had expected: they were still only seven and five when this happened. Yet for them, as for me, transplantation was a benign experience compared with that of so many people. We were welcomed by a family, we were not a different colour, and our dress did not distinguish us markedly from the local population, even though I was the only jeans-wearing woman in town at that time. We were not escaping from war, likely death or persecution. We had not been detained in a refugee camp, had never endured squalor or hunger, and had not been threatened with a move to yet another very foreign place, where we might have had to face the prospect of more suffering. The ABC news is providing background as I write: the High Court is in session in Melbourne, in an attempt to prevent the Federal Government from going ahead with its plan to send a batch of asylum seekers to Malaysia. In another report, a seven-year-old child refugee is refusing to eat. I am not sure why this incident is deemed newsworthy: the only wonder is that the report mentions just one child. My eldest son had a session of not eating, despite more favourable circumstances. And indeed, his migration as a child had such an impact on him that it remains the defining fact of his life. He returned to Australia nine years ago and has not been back to Greece since. Any migrant's life is divided into two: the before and the after. But at least adults have a little hope of understanding the pain, and coping with it, although some find the experience almost unendurable: I once read of a man who kept on fainting for no particular medical reason. Even the most equable of children must find the experience bewildering at best, and agonising at worst. And if they migrate alone? Such a plight defies the imagination. I ponder these matters as I walk around Flemington, my very temporary home. The Sudanese and Somalian women float gracefully along Racecourse Rd, often smiling shyly. They seem to manage the shopping and office routines with great calm and dignity, which is more than I can say for my old self in Greece. And the shopkeepers and office workers deserve praise, too: I have observed only tolerance and courtesy. But the real wrench at the heart comes when I see mothers with children. My eyes are well open then: to the little boys in their hoodies, to the little girls in their pretty winter frocks and little headscarves. So far, so good, I think to myself. At least as far as I can tell. But the real struggle lies ahead for these families, as the children become, in my mother's phrase, dinkumised, and the parents try to resist the process, mostly to little avail. There is no other word for it but hard. I learned that when raising Hellenised Australians. Mothers have to relinquish their power rather sooner than expected. The peer group and host society take over, and while the child is establishing his or her identity, the mother is having hers challenged. Very often, all we can do is hang on by our fingernails and hope the end result will be worth it. In my case, it has been. 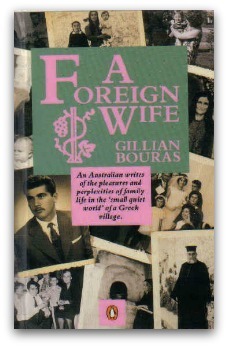 Gillian Bouras is an Australian writer who has been based in Greece for 30 years. She has had nine books published. Her latest, Seeing and Believing, is appearing in instalments on her website. Like GIllian, I went to live in another country with my husband, taking with me two small children aged 4 and 17 months. Perhaps being younger, my children seemed not to find the change so traumatic, but ten years later we returned to Australia with four children, and uprooted them all again after another four years to return to Croatia. Adjustments were hard for all of them, twice. I too feel very sympathetic towards the people coming here as refugees, most of them from horrific backgrounds and with no knowledge of the English language. Their circumstances are so much more difficult than those encountered by my own family, and it is amazing that so many of them do succeed in their new lives, hopefully becoming new Australians without losing their own identity. I completely relate to Gillian's thoughts and feelings.... Absolutely - my own life is neatly divided into before and after.... Refugees flee their countries for horrible reasons and often have indescribable journeys to get to Greece. I do volunteer work with the Avlona Juvenile Centre in Attikis and there are boys there (14-21) who have somehow made it to Greece, only to end up in prison. Having arrived illegally, with nowhere to live, no work and not even speaking the language they are vulnerable to the criminals who take advantage of their helplessness and since they are trying to survive, do things they might not normally do. Not all inmates are "good" but neither are all of them "bad" and the way I look at it is, they are ALL some mother's son.... By contrast, I had it easy. I am English and arrived as a newlywed married to a Greek in Athens in '78 - even though I did not have the language I had a loving husband who dealt with the bureaucracy. I hated relying on him for everything but that's how it is when you don't have the language and you are living in a totally foreign culture. In spite of being warmly welcomed by the Greek family I found it hard to cope initially. I was not sorry to leave in '87 by which time my son was 6 1/2 and my daughter 18 months. We had a very happy 4 yrs in Belgium and returned to Athens in '91 for two years and then back in Belgium in '93. My kids finished their education in Belgium and chose university in the UK - where they still are and prefer to be - now aged 30 and 25. They were educated in the Greek section of the European school, mixed with Greeks for all their school lives but they were raised out of Greece for most of that time and though regularly visited for the summer, Greece is for vacations as far as they are concerned! We retired and returned to Greece in 2007 where I am happy to be! I have resigned myself that my kids will never live in Greece, but my dear husband doesn't give up hope that one day they will settle here! For me, wherever they are, if they are happy, that's where they should be.